Life's Tips and Tricks: Look Who's Here! Dreams do not only happen when you're asleep. Fairy Hobmother is here to bring a treat! Well, if I sound like an inspired poet, it's because I was really happy and honored that out from the magical fairy land comes a pleasant surprise! Yes, it is! Fairy Hobmother has finally heard my wish, as my blog, "Life's Tips And Tricks" was visited and showered by his magical charm. I'm so excited to bring the good news! 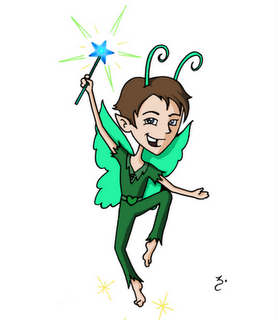 Fairy Hobmother whispered to me that he is here to stay in the blogosphere, to bring more happiness and cheers to everyone. Well, what could be more exciting than having a glimpse of the top five washing machines and having an opportunity to own one. Fairy Hobmother and his fairy lords are really busy going around the cyber world to sprinkle some love. So, if you want to meet him in one of your blogs, do leave a comment here with links to your site and who knows, you might be bumping on him right on your door steps to accept his gift of love. You can also follow him on Twitter to know what he has been up to lately.